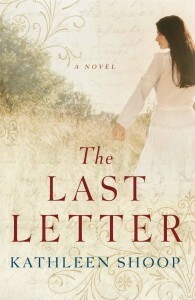 I read The Last Letter by Kathleen Shoop and was mesmerized by the story from the beginning, when a family moves from high society to the prairies, in hopes of escaping a full-fledged scandal. Starting over in less than ideal surroundings - in an inhospitable environment - the family members do what any family who wants to succeed does: they join forces with the locals, using their combined skills to make life a little easier for everyone. Even so, nature could not be predicted and took the lives of children and adults unexpectedly. The author did a magnificent job of drawing the scenes for me, as though a painter with a brush, so that I could see what was happening, enabling me to be part of the scene, as though an outsider looking in. However, the suspicion of her husband (Frank's) infidelity placed his wife (Jeanie's) level of trust on shaky ground. I watched as she struggled - desperately trying to remember and hold on to the earlier times in their lives when they were smitten with each other. I looked on as Jeanie closed her eyes, convincing herself that she could continue on and do what needed to be done - even though she had developed emotional feelings toward another man. However, when Frank's infidelity was exposed, it changed everything inside her. It resulted in the death of one of her children; it was then Jeanie acknowledged that she couldn't continue living as things were. Ultimately, Frank left for a while, promising to be back. However, in his absence, she went to visit her son's grave and made a discovery which would challenge everything she had held dear. It was one of the most powerful scenes in the book. Life as a single parent, however, was met with more challenges than Jeanie was able to endure. As a result, she had to make two important decisions concerning her older children, decisions which would impact her relationship with them, or lack thereof, throughout the years. As a much older woman, she is suffering from Cancer and, despite the back story taking up a large portion of the book, the conclusion is equally powerful because, at long last, a letter explains it all...but can her children find room in their hearts to forgive her before it is too late? To read more about this superbly written book, please click the cover which will take you to the book's page on Amazon.